Ask any nature lover and they would tell you that hayabusa is the japanese word for falcon. In particular, hayabusa refers to the Peregrine falcon one of the swiftest birds that nature has known. This bird of prey is believed to spots its prey when flying several meters above the earth. With a deadly accuracy the hayabusa falcon zeroes in on it's prey and grabs it in it's feet. The hayabusa pendant from Kaisilver salutes this tremendous creation of nature, a living creature that packs speed, accuracy and efficiency into one majestic flying machine. The Kaisilver team had to study the history of the hayabusa and learnt some interesting things about the use of this word. This hayabusa pendant has the name of the bird produced in sterling silver or gold. Though generally taken to be a men's pendant, there is no reason why a gold or silver hayabusa pendant cannot be worn by ladies. Complete customization for all Kaisilver custom jewelry means that, you can request for the dimensions to be adjusted according to your preference. Hayabusa is the Japanese name for an extremely sharp and fast falcon. The precise and swift method used by the hayabusa to dive on to it's prey has impressed man. The Kaisilver hayabusa mens pendant is fully customizable, you can choose the metal and dimensions for your pendant. Pendant Meaning : The hayabusa peregrine falcon is a little larger than an adult crow and when flying, can attain a mind boggling speeds of 320 km/hr or 200 mph. A female hayabusa falcon is slightly larger than it's male counterpart. It has an uncanny and almost unbelievable ability to spot it's prey from several meters above. Peregrine prey normally consists of smaller birds but it can also prey on smaller animals. While normally hunting it's prey during dusk and dawn, hayabusa falcons can also adapt to night conditions to look for prey. Most birds would drop dead with injured lungs when flying at such high speeds, but the pegerine falcon has it's own natural ways of protecting itself. It is the speed and accuracy which the hayabusa catches it's prey that, has made it a highly respected bird. The Hayabusa pendant when worn is believed to make a person sharper and more attentive. With an impressive metal weight and fine craftsmanship, you can rest assured that your gold or sterling silver mens hayabusa pendant will last a lifetime. Gold Or Silver Pendant : Coming back to our gold or sterling silver hayabusa men's pendant the jewel is not shaped like a falcon. The ancient japanese alphabet that symbolizes the word hayabusa is cast in solid gold or sterling silver. 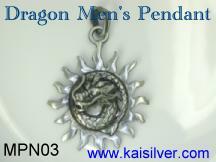 This is a sturdy mens pendant with handsome dimensions that are well supported by good metal weight. This mens pendant can be custom made with the dimensions that you choose. All sizes are supported by proportionate metal weight and good craftsmanship. 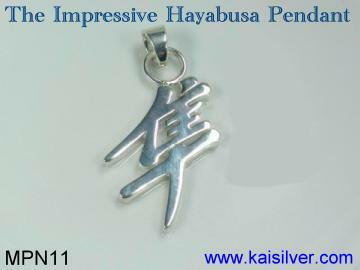 The sterling silver hayabusa japanese pendant allows you get a sturdy pendant and a silver chain at at a modest budget. You can also wear this men's pendant with a leather chord, something that is very trendy now. Your hayabusa pendant comes with a sturdy bale that can take a large chain that is anywhere from 2mm to 8mm wide. You could order just the hayabusa men's pendant from us and shop for the chain at your local jeweler or, request us to get the chain for you. Interesting Hayabusa Information : Two of the main charactertistics of the hayabusa falcon are speed and deadly accuracy. It is therefore no surprise that many man made machines and devices have been given the name hayabusa. Japanese motorbike maker Suzuki used the name hayabusa for one it's hottest selling motorbikes. The Suzuki motorbike tries to whip up visions and imagination of speed by giving the bike the Japanese name Hayabusa. This bike reaches a speed from 0 to 100 mph in under five seconds, we have not verified maximum speed capabilities of the Suzuki machine but it is unlikely to come near the amazing 200 mph speed level of the peregrine falcon (hayabusa). There is another scientific mission that has been nick named hayabusa. On 9 May 2003, the Japanese launched a spacecraft to fly in orbit around the planet earth, this spacecraft was named hayabusa. The objective of this space mission was to keep a watch for interesting events and objects in outerspace. Information regarding these celestial 'prey' would be relayed to earth to be analyzed and understood. It is interesting to note that this mission was named hayabusa because of it's similarity with how the hayabusa falcon looks for prey from above the earth's surface. 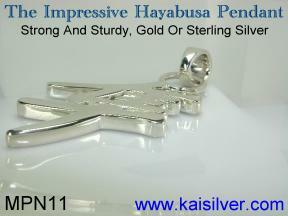 The above image clearly shows the high level of durability that is built into the Kaisilver Hayabusa pendant. This men's pendant has a good thickness of around 3mm. The bale is also designed and produced with a very sturdy construction. We are today regarded as the world's leading online provider of high end custom jewelry. Over 7,500 jewelry lovers spread across 19 nations, today regard Kaisilver as the best source for all their jewelry and gem stone needs. The dramatic rise in demand for Kaisilver custom jewelry has been largely due to a highly satisfied customer base. We do not indulge in extravagant marketing campaigns or play tricks and gimmicks that tout junk quality jewelry as the best. Our policy has always been to provide buyers with good custom jewelry and educating them regarding various issues in involved in gems and jewelry. We strongly believe that a well informed buyer will make the right decision, this will ofcourse work in the best interest of both sides. Some of the world's finest designers and design consultants work with us to ensure that designs are evaluated thoroughly. We lay stress on external appearance, tradition and longterm durbaility when designing and producing our custom made jewelry. Each jewel is designed after a thorough study of the tradition and background of the jewel. It is this systematic approach to designing and producing jewelry that has made us the world leader in high end men's rings, the claddagh ring and other jewels like the hayabusa pendant. Over 3,500 skilled craftsmen and gem stone cutters work on all our custom jewelry orders. A dedicated team of jewelry production experts and quality checking staff ensure that each jewel is a high end creation. Direct access to a staggering 200 million carats of gem stones allows our buyers to choose the gem stone of their choice. You need not worry whether the gemstone is mined 20,000 feet above sea level on a barren mountain or 300 feet below a hot and blistering desert in Australia. We can procure every gem stone that you need and custom cut it to fit the gold or silver jewel that you order. Unlike most jewelers who perform only a single quality check before shipping the jewel, at Kaisilver we have a dedicated team of quality checking professionals who closely monitor production at every stage. Our objective is to ensure that the buyer gets a good quality jewel. We need not satisfy shareholders or investment bankers, our entire business is built and developed on customer satisfaction. Kaisilver buyers include lawyers, government officials, models, members of the armed forces, real estate developers, pilots, sportsmen, students, doctors and surgeons, professors, housewives, casino and resort owners, financial experts and others. The positive results of our fanatic approach towards customer satisfaction can be seen in the comments of our buyers, we present a few buyer comments here. Payment can be made through Paypal to our email for paypal INFO@KAISILVER.COM and you can register for a free paypal account at www.paypal.com In recent months many buyers have complained regarding the huge amounts of information that paypal needs to open a new account. To handle this issue, we also accept payments through Western Union Money Transfer. Their website provides information regarding Western Union Agents near you and also accepts online payments from few countries like U.S and U.K. You can visit the website at http://www.westernunion.com We urge you to try using Paypal before choosing Western Union as your mode of payment. Not everyone feels comfortable when paying through Western Union Money Transfers. Though this mode of payment can be used to pay for merchandise, it was originally used for transactions where the sender and receiver were known to each other. 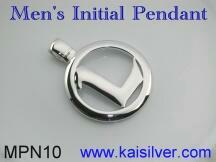 Below are a few other high quality custom men's pendants from Kaisilver. Like all other Kaisilver custom jewelry, these pendants can be made in gold or sterling silver. The same attention to detail and good quality craftsmanship is provided for gold and silver men's pendants. All jewelry can be made with your designs or ours, you could therefore use the hayabusa theme and request for a hayabusa ring to be made in gold or silver too. Our designers continously research designs and their meaning, this thorough background allows us to create jewels that match your requirement . We also create the world's finest men's rings and are credited with making the finest rendition of the historic claddagh ring. 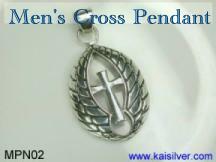 Men's cross pendant, sterling silver or gold with an antique style. click for full information. The fury of the dragon set in the heat and light of sun, impressive pendant. click for full information. Amazing initial pendant, sturdy and durable. Design variations available. click for full information. Important: The dimensions of all men's pendants can be made according to your requirements. You can also request for pendants with other symbols and alphabets to be custom made for you. The characters could be Chinese, Japanese, Egyptian or any other. Both gold and silver men's pendants are produced with the same quality of material and craftsmanship. We custom make all types of jewelry, the design can be yours or ours. center> All content on this page is the property of www.kaisilver.com, legal action will be taken to the highest extent possible if cases of copying or replication of this content are noticed. If you are being legally sued for any such incident, please do not contact us with apologies or settlement deals. Our legal team has been given complete power to handle such cases.